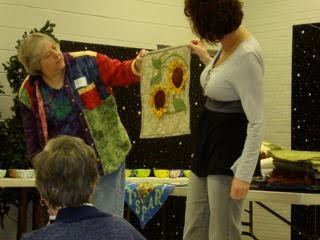 This past Saturday District 4 of Quilters of SC had our annual meeting. For those of you that dont know, Quilters of SC is divided into 7 districts in the state, using county lines. District 4 is in the middle of the state. We gathered for food, fun, and quilting. It was a rainy cold day. 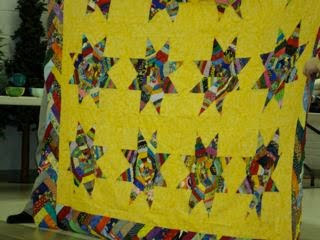 What a great way to spend it, with quilters and quilts. Pictured is me, on the let and Terri on the right. The string star quilt is my show and tell. I still have to find time to quilt it. Cathy Gainey from Rock Hill was our guest speaker. She told us about her favorite quilts. She loves to use plaid, homespun, and wool. Cathy hand dyes wool and had some to show and sell. I think she sold most of what she brought. I know I bought some. Cant wait to work with it. 2 inch squares for my Ho Ho Ho quilt....if I make another I will use 2.5 inch blocks. The center section only needs blocks then both sides of the H and the O can be done in a solid strip.